Nike has always been a formidable marketing organisation so it shouldn’t come as a suprise that they continue to lead the way when it comes a richer more three-dimensional branding. Indeed the entire concept of RunLondon or RunNYCity, took them into a space they could easily own and imprinted their values on it. 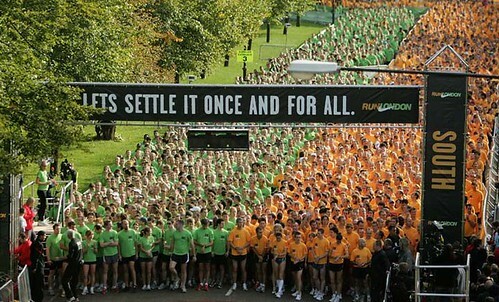 The sight of 10,000 Londoners wearing identical blue Green and Orange tops in Hyde Park a few weeks back couldn’t have left us in any doubt of that. Well their latest move makes RunLondon look like nothing. 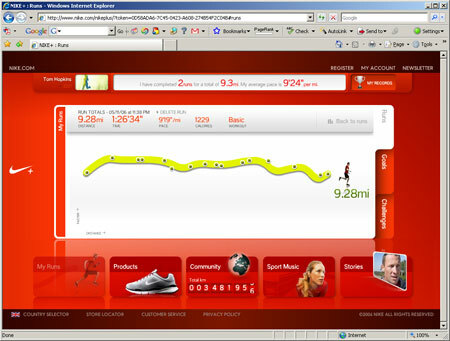 Partnering with Apple of all people, they’ve produced a system that turns any iPod into a complex run monitoring piece of kit (when partnered with certain Nike shoes). As you run, you get audible annoucements telling you how far you’ve got, your average pace etc. Even better, when you get home you can see exactly how you did mile by mile with a graph (see below, I don’t know how it knew I was wearing a red top). You can then compare your times, track your progress, even compete with others around the world. Definitely one to file under “wish I’d thought of that”. MINOR UPDATE: I just got back from another cold and wet run. When I finished the ipod+Nike session, I got a voice update from Paula Radcliffe: “hi this is Paula Radcliffe, you’ve just completed your personal best mile” (although still a shocking time!). How cool is that! ?